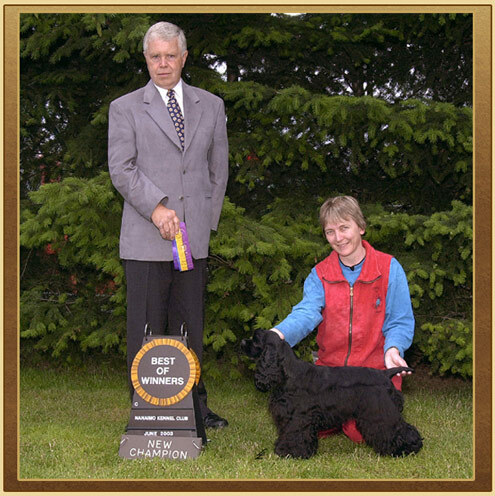 DEDICATED to the breed since acquiring our first registered American Cocker Spaniel in 1982 we strive to maintain the integrity of the breed by selectively breeding dogs that measure up to the standard for our breed. In order to do this we must first and foremost produce sound, healthy dogs with excellent temperaments. To ensure we are succeeding we compete to attain titles; in Conformation where our dogs prove they have the correct structure and temperament for the breed and in Agility, Flyball & Obedience, where they prove they have both the mental and physical ability to be good companions! ALADDIN COCKER SPANIELS must pass specific health tests before they are used in a breeding program. The main areas of concern are eyes, hips, and temperament. Our breeding dogs undergo an annual eye exam performed by a member of the American College of Veterinary Ophthalmologists (ACVO) and registered with the Canine Eye Registration Foundation (CERF). Hips are X-rayed after the animal reaches the age of 2 years and are sent for evaluation to the Orthopedic Foundation of America (OFA). It is usually only necessary to do hips once during their lifetime. Temperament is always carefully evaluated before a dog is considered for our breeding program. The American Cocker Spaniel can make a wonderful family pet. Their exercise needs are fairly minimal. They will be happy to walk, hike and swim with you and will enjoy life just being your best friend.